The torpedo boat was constructed in Germany along with the series of four similar boats (Kit, Kasatka, Skat, Delfin) at the «F.Shihau» shipyard, Elbing. The Bditelny was laid down as Kit on 18 November 1899, entered service 29 July 1900. On 19 October 1900 Kit left Kronstadt for the Far East together with Delfin and Som torpedo boats. On the way they were caught up in the stormy weather and there were some breakdowns. The group visited several ports and at last arrived to Pirey. During the stay the boats were put into docks and had their submerged parts cleaned and painted, then the torpedo boats were painted white as was adopted for the foreign cruises. On 23 April 1901 the group arrived to the port Arthur. On 9 March 1902 the Kit was renamed into the Bditelny. During the Russian-Japanese war she took an active part in long-range patrols, stood guard over the harbor in the port Arthur, participated in mine-sweeping and mine-laying operations. 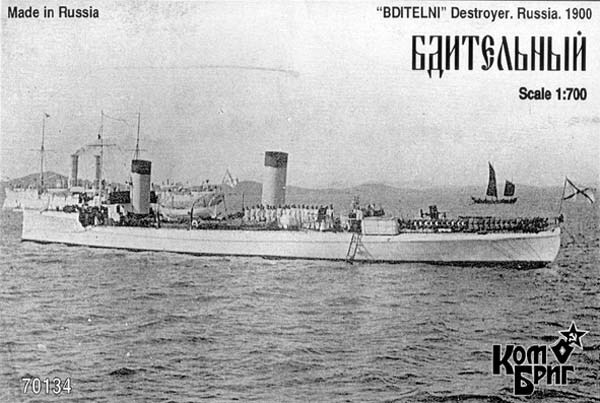 On 29 October at 16.00 the Bditelny ran across a mine returning from the Bely Volk Bay and towing the Serdity torpedo boat. The Statny torpedo boat towed the damaged Bditelny to the port Arthur, but the boat didn't enter service again. The boat had been blasted by the crew before the port Arthur's surrender. During the pre-war period on the Far East she was painted in the following way: sides, turrets, deckhouses, masts and air inlets were painted white; edging of the smoke-stacks – black; the smoke-stacks themselves – yellow; decking – red brown linoleum; cannon barrels – burnished steel; nameplate –gilded. At the beginning of the war she was painted to match the combat coloring of the first Pacific Squadron – all above water parts except for smoke-stack edgings and cannon barrels were olive drab. The superstructure is pretty simple on this little torpedo boat and consist only of a couple platforms. The guns are and miscellaneous fittings are well done and will will only require a little cleanup. Instructions are two sides of an A-size sheet. 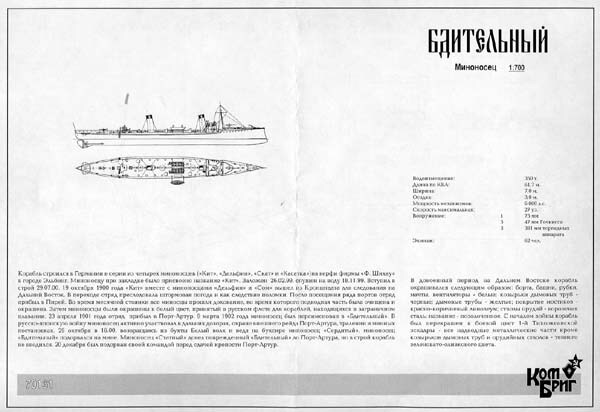 One side has a bit of history and specs as well as plan and elevation views of the ship. Unfortunately they are is Russian, though some of the latest Combrig kits I have seen also have english translations. 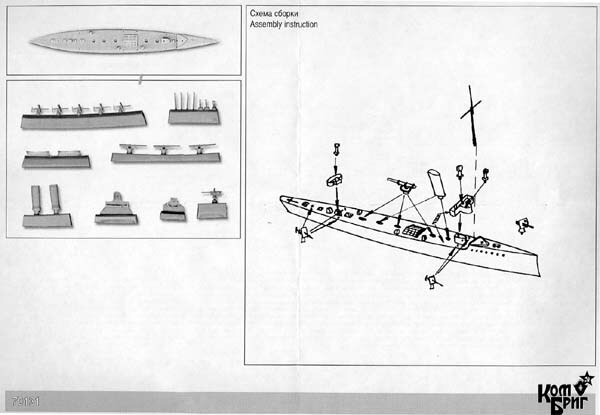 The back side include a scan of the kit parts and and exploded view of the ship showing where everything goes. This kit would make a good first resin kit for the 700 scale waterline modeler. 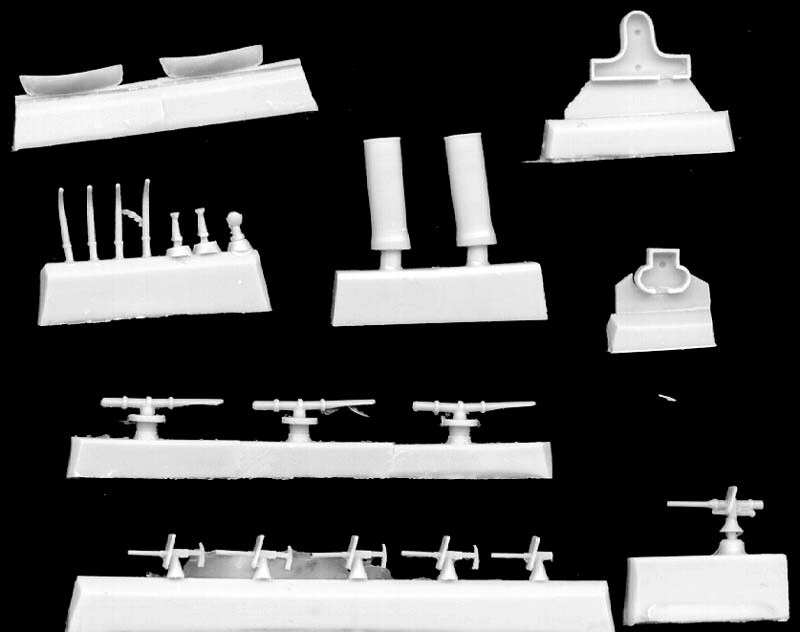 It is simple enough to be competed in an evening or two and will give you an idea of what to expect from a resin kit without being overwhelmed by all the parts. Thanks to Pacific Front Hobbies for the review sample, they have an extensive line of Combrig kits on their website.